Nevertheless, the premise of their book is off base. Why? Because even if we could teach or program machines to be ethical, so what? Ethics does not provide a sufficient safeguard against evil. In fact, I would go as far as to argue that it is a complete waste of time to program ethics into machines. Which theory of ethics would we choose from? There are so many competing theories of right and wrong, that any ingenious person or machine could justify just about any decision on moral grounds. By the same token, I am not sanguine about the prospects of “crowdsourcing” morality, since the crowd could be wrong on moral matters. Instead of machine morality, perhaps we should focus on machine mortality: we could require all advanced machines or strong AI to self-destruct after some period of time. In the alternative, we would spend less time thinking about ethics and more time inventing new systems of effective checks and balances: machines that monitor and counter other machines! That is, instead of trying to teach ethics to future machines (as Wallach & Colin propose), or instead of “crowdsourcing” morality (as others have proposed), why not look at this problem in game theory or strategic terms? Consider the domains of markets or politics. Without competition (i.e. 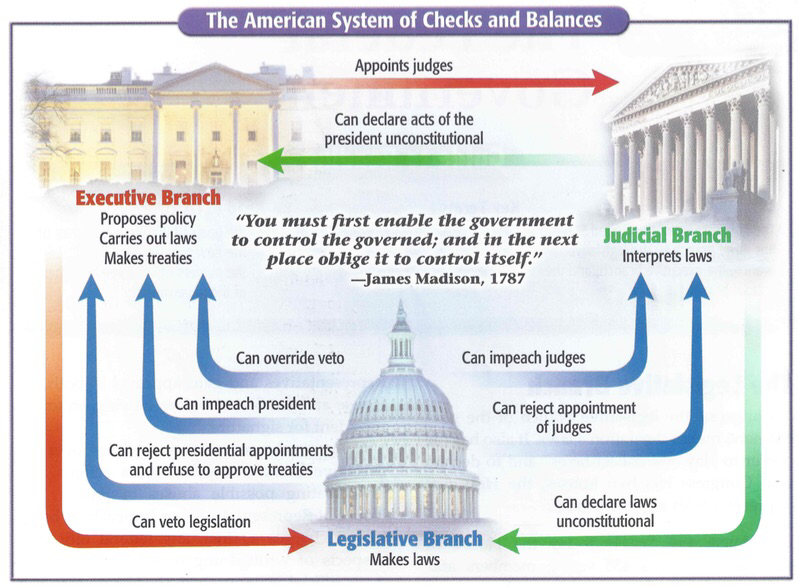 open markets with free exit and entry) or some formal system of checks and balances (such as the constitutional one depicted in the image below), no amount of ethics or morality will save us from ourselves. Why doesn’t this same logic apply to AI?